Enjoy one of the best massage therapies in Budapest, right in Szechenyi Spa Baths and Pool starting from 47 Euros, including your bath ticket of 22 Euros, so basically you pay only 25 Euros for the therapeutic medical massage! In addition to a 20 minute massage session, you can book a 45 or 60 minutes long massage in massage and bath ticket deals (for single travelers, couples, families, etc.). Massages in Szechenyi Baths are available between 10 am and 6pm every day. Please add your preferred massage hour in the booking form. The confirmed massage hour will be sent to you via email. If for any reasons you cannot find this email, please contact us via email at info [at] szechenyispabaths.com. Massages are automatically cancelled – without a right to refund -, if guests do not check in min. 40 minutes before the massage starts. Massage treatments are very popular in Szechenyi Baths, especially at the weekends (all year). Please book your therapy 1 day ahead by indicating the hours that best suit you (please allow a 2-3 hour time range). Massage treatments take place in private massage rooms. Book your massage at Szechenyi Bath comfortably now: 2 in 1 deals, the price of the massage includes the entrance to the bath too. The masseuses for these massages below are the official medical massage therapists of Szechenyi Baths (other massage salons also rent places in the bath). All the prices include the massage and the entrance ticket. The ticket is a full day entrance in the value of 22 Euro, which is included in the massage price, as seen above. The Prices are for 2019, until December 31. 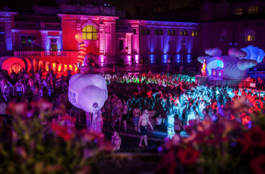 Note: Szechenyi Bath does not sell bath tickets directly online, our partner booking site manages online tickets and massages. After submitting the booking form, you will be redirected to the Massage Agency PayPal account. 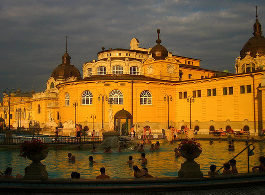 Bath Ticket + Szechenyi Aroma Massage (20 min) at Szechenyi Baths: approx. 47 Euros. A 20 min aroma massage with a medical massage therapist, plus the entrance ticket to the Szechenyi Bath with a private cabin and a fast track, quick access to the bath via the Help Desk. 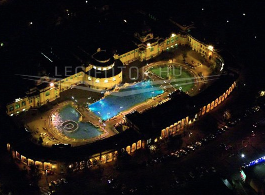 Bath Ticket + Szechenyi Thermal Massage (20 min) at Szechenyi Baths: approx. 48 Euros. A 20 min thermal massage, mainly used for locomotive issues and disorders, with a medical massage therapist, plus the entrance ticket to the Szechenyi Bath with a private cabin and a fast track, quick access to the bath via the Help Desk. Bath Ticket + Harmony Aroma Massage (45 min) at Szechenyi Baths: approx. 77 Euros. 45 min refreshing massage with a professional medical masseuse at Széchenyi Bath. The entrance fee is included in the price, as is the private changing cabinet, and the speed entrance at the Help Desk. Bath Ticket + Harmony Aroma Massage (60 min) at Szechenyi Baths: approx. 90 Euros. 60 min refreshing massage with a professional medical masseuse at Széchenyi Bath. The entrance fee is included in the price, as is the private changing cabinet, and the speed entrance at the Help Desk. Bath Ticket + Harmony Aroma Massage for 2 persons (in the same room) (45 min) at Szechenyi Baths: approx. 146 Euros. Bath Ticket + Harmony Aroma Massage for 2 persons (in the same room) ( 60 min) at Szechenyi Baths: approx. 167 Euros. On one hand, by booking your tickets and massage in advance, you will avoid the long lines by the entrance (especially the summer months are packed with bath visitors). On the other hand, you will secure your massage in advance, so there is no need to “come back next day” or wait “3-4 hours” for the next available massage therapy spot. With our ‘bath entrance plus massage’ deals, you will elegantly sail through the crowded bath entrance through a separate VIP Welcome Desk. Speedy boarding to the best wellness facilities of Szechenyi Spa Baths? Check! What kind of VIP massages and massage packages are available in Szechenyi Spa Baths? The Aroma Massage, is a Swedish massage therapy treating the upper body (back, shoulders, neck areas), easing the muscle tensions and general stress. During the 20 minute massage, fragrance free, warm aromatic oil is used to enhance the effects of the massage treatment. This massage is a calm, relaxing treatment using slow, tender movements. The Aroma Massage is recommended for guests who have recently experienced a stressful period in their lives, or suffer from sleeping disorder. It is also recommended as a first massage experience for those who consider themselves beginner spa guests. The Thermal Massage is a stronger treatment, the massage therapist works with mainly stronger, more powerful techniques. The massage aims to find the painful areas of the body, and helps relieve the muscle tension and joint pains. Before starting your massage at Szechenyi Baths, please let the massage therapist know what you are expecting from the massage: a general refreshment, certain symptom relief in a given area (e.g. around your waist, in your upper arms), or if you have any special health conditions you feel important to share with the therapist. The masseuse will personalize the massage treatment for your needs, so it is definitely worth sharing your expectations with your therapist. The Harmony Aroma Relax Massage is one of the most popular treatments in Szechenyi Baths. This is a calm, slow and relaxing full-body massage (including face, head and feet massage) using tender movements and warm aromatic oils that spoil both your body and soul. You can book the Harmony Aroma Massage for single guests, or in double massage rooms for 2 people (couples, friends, etc.). Buying a massage for 2 is a good deal, and you can save some Euros by booking for 2 (in the same massage room). Guests can choose the following oils for the massage: rosemary, orange and elderflower. 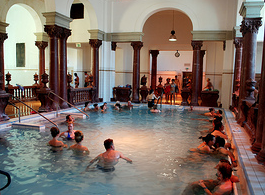 The Royal Thermal Massage is a luxurious massage in Szechenyi Spa & Baths, based on Swedish style massage techniques. The massage therapist uses energetic and dynamic movements to help the tension in the muscles relax, and ease the pain of the body. Initially, the massage therapist checks the condition of the musculature, locates the painful points of the body, and applies a personalized treatment. Please let the therapist know about your personal preferences. The Royal Thermal Massage is a full-body massage. The longer version (60 min) includes refreshing foot, facial and head massage as well. The Royal Thermal Massage in Szechenyi Baths is available for single guests, or in double massage rooms for 2 people (couples, friends, etc.). Buying a massage for 2 is a good deal, and you can save some Euros by booking for 2 (in the same massage room). Mud is an essential element of nature, as it contains important minerals which have positive effects on human health. This treatment begins with a massage, applying moderately strong techniques, with massage oils. Following the massage, a mud pack is then placed on the relaxed muscles for 15 minutes. The prices of VIP massage package deals booked at the official Szechenyi Bath massage therapists include the full day bath tickets at Szechenyi Baths with a private cabin (all massage treatments with the code SzB). You can ask further questions, special requests via email to your VIP massage guide. Hi there, I have booked tickets for the baths. Can I book massages separately for tomorrow? I am afraid all the massages are booked up for tomorrow at Szechenyi Spa Baths! Hello! We are planning to come to Szechenyi Bath on Sunday 10th. I am planning to book for a Royal Thermal massage as well, do you think that I will be able to reserve on Saturday evening? Or is it better to book in advance? 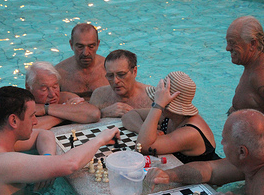 Weekends are always very busy in Szechenyi Baths, massages almost always sell out days before. I would suggest online and in advance booking. Appointments are subject to availability. Once you make the payment, we will book you in for a treatment, which is the closest to your preferred hours. We are 2 (sisters) we would book for 24 Sunday for bath therm Szechenyi, 45 minutes of beer spa for 2 and 2 tubes and after 2 massages 60m Double Royal. How is it possible to book all of 3 things? and 1 x Aroma Gentle Massage 20min & Ticket +SzB for my friends and I at 4.30pm on 16th. Please can you confirm date and time is ok as nothing came through on the email confirmation. Additionally I read on your site there is a particular entrance for wheelchair access, please could you let me know which one as one of our party is in a wheelchair. Hi! Is it possible to book the Hungarian Mud Therapy online? The only options are gentle and stronger massage. you can find the Hungarian Mud Treatment under the 45/60 min gentle massages. Hope we can welcome you at Szechenyi Spa Baths! Is it possible to book a mud massage for 4 people in the same room or only two and two? Unfortunately the massages rooms cannot accommodate more than 2 people at the same time.